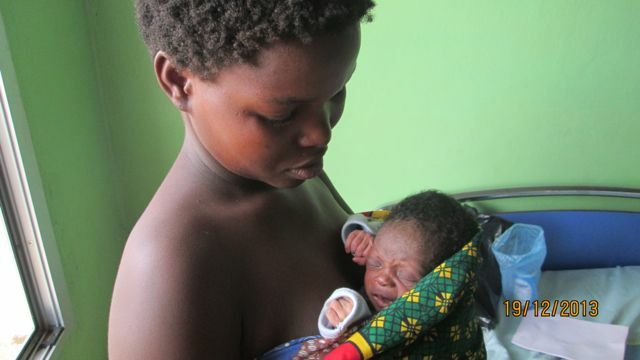 Meet baby Ester pictured above with her mother Tiyanjane at Comfort Community Hospital, which is under Andiamo Youth Coopertive Trust in Balaka, Malawi. Ester was born with a low birth weight and is participating in our Kangaroo Mother Care (KMC) program. This treatment comprises of 24 hour skin-to-skin contact with the mother and exclusive breastfeeding for all babies, premature or full-term, that have a birth weight of less than 2.5 kg. In the picture, Ester was 12 days old and weighed 2.1 kg. With her mother’s constant tender, love, and care she has been making steady progress! This entry was posted in Health Care and tagged Andiamo Youth Cooperative Trust, Balaka, Comfort Community Hospital. Bookmark the permalink.